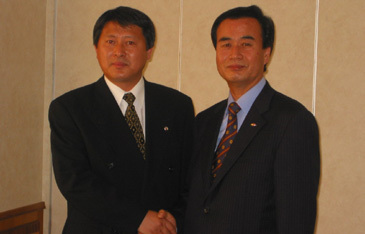 Manseek Choe (right), deputy secretary general of the World Taekwondo Federation, poses with Ri Yong-sun, deputy secretary general of the International Taekwondo Federation, shortly after signing an agreement at a hotel in Beijing, China, on June 28, 2005. BEIJING (June 28, 2005) – The World Taekwondo Federation and the International Taekwondo Federation have agreed in principle to establish a committee to discuss technical aspects of the two taekwondo bodies. At their two-day talks here on June 27 and 28, the two sides agreed to have one co-chairman and two to three members from each side for the proposed Coordination Committee for Technical Integration. They also agreed that the committee will first discuss technical matters related to poomsae, which refers to taekwondo patterns, and competition methods, while trying to find any possible ways for the two taekwondo organizations to jointly participate in the Olympic Games. The two sides agreed that the launch of the Coordination Committee is subject to the approval of their respective decision-making organs, such as the Executive Council and the General Assembly. The agreement was signed between Manseek Choe, deputy secretary general of the WTF, and Yong-son Ri, deputy secretary general of the ITF. "The WTF made it clear that the above matters could be taken into effect under the condition that the WTF Executive Council and the General Assembly might approve them at its meetings," as stated in the agreement. The WTF is scheduled to hold its Executive Council meeting in Seoul on July 20, in which the ITF issue will be on the agenda. The talks were the result of the WTF-ITF meeting held in Lausanne, Switzerland, on June 3 this year. At the Lausanne meeting, WTF President Chungwon Choue proposed the formation of a coordination committee to discuss technical matters involving the two bodies.